Please refer to the User Guides for 2006 updates. Algorithms have been developed to map snow and ice cover (including ice on large, inland lakes), albedo, sea ice cover, and sea ice surface temperature (IST), using Earth Observation System (EOS) Moderate Resolution Imaging Spectroradiometer (MODIS) data. The Level-3 products will provide daily and 8-day composites of global snow and lake ice cover at 500-m resolution, and sea ice cover and ice-surface temperature (IST) at 1-km resolution. Statistics will be provided regarding the extent and persistence of snow and ice cover at each grid cell for the Level-3 products. The snow-mapping algorithm (Snowmap) employs a grouped-criteria technique using the Normalized Difference Snow Index (NDSI) and other spectral threshold tests to identify and classify snow on a pixel-by-pixel basis, and to map snow cover in dense forests. The usefulness of the NDSI is based on the fact that snow and ice are considerably more reflective in the visible than in the short-wave IR part of the spectrum, and the reflectance of most clouds remains high in the short-wave IR, while the reflectance of snow is low. The sea ice mapping algorithm (Icemap) uses a grouped-criteria technique employing the NDSI and surface temperature to determine sea ice cover, a split-window technique is used to estimate ice-surface temperature (IST). Snowmap and Icemap currently employ the standard MODIS land group land/water mask as input and the MODIS cloud mask to define the areas of interest. The MODIS Level 2 calibrated radiance product is used as input. MODIS snow and ice products are archived and distributed by the National Snow and Ice Data Center (NSIDC) Distributed Active Archive Center (DAAC), located in Boulder, Colorado. Validation of the MODIS snow maps is an on-going process. Thus far, the focus has been validation of the 8-day composite snow maps of North America using National Oceanic and Atmospheric Administration (NOAA) operational snow maps, and a limited amount of field measurements. Landsat Enhanced Thematic Mapper Plus (ETM+) data, when available, have also been used for validation of the MODIS snow maps. Results show that the MODIS snow-mapping algorithm is very sensitive to mapping snow, however, the snow maps often show more snow than really exists. This is especially true in warm areas where no snow should exist. Additional criteria to screen false snow detection have been developed and integrated into the algorithm. The accuracy of the MODIS snow maps varies with land-cover type. Hence, the Snowmap algorithm has been and will continue to be tested for a variety of land covers. Error estimates have been determined from field measurements for different land covers, and these errors are used to estimate the expected maximum monthly and annual errors in Northern Hemisphere snow mapping using Snowmap. Exclusive of clouds, the maximum, aggregated Northern Hemisphere snow-mapping error is expected to be about 7.5%. The error is expected to be highest (around 9-10%) when snow covers the boreal forest, roughly between November and April. Sea ice extent, IST, and generalized sea ice type (snow covered sea ice and new ice) have been estimated using reflectance and emittance characteristics derived from MODIS Airborne Simulator (MAS) data over the Bering Sea. Independent validation activities in support of the Icemap and IST algorithms were undertaken by the MODIS sea ice validation scientist, Dr. Shusun Li, during a cruise in the Southern Ocean in March 2000. For post-launch validation of river-basin scale areas, Landsat-7 Enhanced Thematic Mapper Plus (ETM+) and EOS Advanced Spaceborne Thermal Emission and Reflection Radiometer (ASTER) data will be used. Advanced Microwave Scanner Radiometer (AMSR)-derived snow and ice maps will be available following the launch of the EOS Aqua satellite. Algorithms will be developed that will employ both MODIS and AMSR data to map snow cover and depth. It is envisioned that a product can be developed that will employ reflective and passive-microwave data that will permit snow extent, albedo and depth to be mapped, thus enabling daily maps to be generated irrespective of cloud cover and darkness. The purpose of the MODIS snow mapping (Snowmap) and ice mapping (Icemap) algorithms is to generate global snow- and lake-ice cover products, and global sea ice-cover products from MODIS data. The Snowmap algorithm is based on ratioing techniques that were first proven to be successful at local and regional scales. Daily snow and ice maps and maximum 8-day, snow covered area (i.e. hemispheric snowline), and daily and maximum 8-day composited sea ice-cover and sea ice surface temperature (IST) Level-3 digital-map products are generated in the Product Generation System (PGS) of the Earth Observation System Data Information System (EOSDIS). 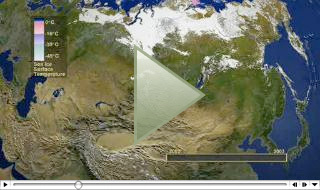 Snow and ice products are archived at and distributed from the National Snow and Ice Data Center (NSIDC) Distributed Active Archive Center (DAAC) at the University of Colorado in Boulder, Colorado http://nsidc.org, and products may be ordered from http://nsidc.org/NASA/MODIS. The MODIS snow maps will augment the valuable record of Northern Hemisphere snow cover that was started in 1966 by NOAA which provided weekly maps (Matson et al., 1986), and continues today with the daily snow products from the Interactive Snow and Ice Mapping System (IMS) (Ramsay, 2000). The numerous spectral bands and superior spatial resolution of MODIS, relative to the Advanced Very High Resolution Radiometer (AVHRR), permits an improved ability to map snow and ice. The MODIS snow cover maps are potentially an advancement over the NOAA maps because MODIS-derived maps will provide snow maps at 500-m spatial resolution (versus 25-km resolution for the NOAA product) and have the ability to discriminate snow from most clouds; also, daily as well as 8-day composite maps will be produced from MODIS data. In addition, the MODIS algorithms are automated thus reducing or eliminating biases due to human subjectivity which are problematic in long-term climatology studies. Statistics concerning snow-cover persistence and duration from the 8-day composites will be generated. 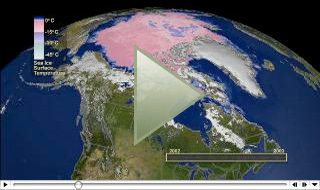 The sea ice maps augment the record of sea ice cover that is produced by NOAA. Currently, there is no IST product generated on a regular basis from satellites. Therefore, the MODIS IST product represents an important advance for the sea ice and global modeling communities. The Snowmap and Icemap algorithms will identify snow, lake ice and sea ice by their reflectance or emittance properties. Snowmap consists of a series of criteria tests and decision rules that identifies snow and lake ice, if present, in each pixel of a MODIS image. Snowmap will generate a data set of global snow cover and of ice cover on large, inland lakes at 500-m resolution. Icemap is structured in a similar fashion to Snowmap, for mapping daily and maximum 8-day composited sea ice cover globally at 1-km resolution. Also at 1-km resolution, IST will be mapped daily and average ice surface temperature will be mapped for 8-day periods, day and night. The basic techniques used in the snow and ice mapping algorithms are threshold-based criteria tests, the normalized difference between bands, and decision rules. Use of the ratio of a short-wave IR channel to a visible channel was determined by Kyle et al. (1978) and Bunting and d'Entremont (1982) to be useful for snow cover mapping, and later utilized by Dozier (1989) to map snow in the Sierra Nevada Mountains. This method is the basis for Snowmap and is also used in Icemap. The basis of the IST algorithm is the work of Key et al. (1997). The IST split-window technique uses the two MODIS IR channels 31 and 32, centered at approximately 11.0 and 12.0 mm. Global-scale snow-mapping errors may be calculated to provide estimates of Northern Hemisphere snow-mapping errors based on prototype MODIS snow-mapping algorithms. Field studies demonstrate that under cloud-free conditions when snow cover is complete, snow-mapping errors are small (<1%) in all land covers studied except forests where errors are often greater and more variable. Thus the accuracy of Northern Hemisphere snow-cover maps is largely determined by percent of forest cover north of the snowline. From the 17-class International Geosphere-Biosphere Program (IGBP) land-cover maps of North America and Eurasia, we classified the Northern Hemisphere into seven land-cover classes and water. Estimated snow-mapping errors in each of the land-cover classes are extrapolated to the entire Northern Hemisphere for areas north of the average continental snowline for each month. The resulting average monthly errors are expected to vary, ranging from about 5 - 10%, with the larger errors occurring during the months when snow covers the boreal forest in the Northern Hemisphere. The annual average estimated error of the future Northern Hemisphere snow-cover maps is approximately 8% in the absence of cloud cover, as determined using prototype MODIS data. Error estimates will be refined after MODIS data have been available for several years. Development of algorithms to map snow, lake ice and sea ice is an evolutionary process. The algorithms may change as input data and information improve, and in response to the results of validation studies. For example, changes in the snow mapping algorithm include a modification to more accurately map snow in forested areas, and to mask out spurious snow cover in warm areas and along coastlines. Further enhancements will be made as validation continues on the snow maps outside of North America. The snow, lake ice and sea ice products will be used to monitor the variability and trends in global snow and ice extent, and to determine duration of lake ice on large, inland lakes. Global snow cover and sea ice are important parameters in the global energy balance, and IST has a profound influence on sea ice growth, snow metamorphosis, and snow/ice melt (Key et al., 1997). It has been shown that global climate models (GCMs) do not simulate the present Arctic climate very well (Bromwich et al., 1994), thus improved measurements of global snow and ice cover and other cryospheric elements are necessary to improve modeling scenarios. The spatial distribution of snow-covered area is a key input to atmospheric models used to simulate weather and climate (Liston 1999). The overall objective is to test the use of MODIS-SNOWMAP remote-sensing products within the climate version of the Regional Atmospheric Modeling System (ClimRAMS) (Liston and Pielke 2000). A consistent record of ice conditions on large inland lakes will permit studies to be done on freeze-up and break-up dates of large lakes. These data can be correlated with regional meteorological conditions and will be useful in climate-change studies. Such a record, at 500-m resolution, may also be useful to operational ice mapping for navigation. However, our planned maps are not designed for such an application because the time required to generate and distribute the EOS data following acquisition is greater than that required for operational use. Satellites are well suited to the measurement of snow cover because the high albedo of snow presents a good contrast with most other natural surfaces except clouds. Because of this characteristic, snow was observed in the first image obtained from the TIROS-1 weather satellite following its April 1960 launch (Singer and Popham, 1963). However, it was in the mid-1960s that snow was successfully mapped from space on a weekly basis following the launch of the ESSA-3 satellite. ESSA-3 carried the Advanced Vidicon Camera System (AVCS) that operated in the spectral range of 0.5 - 0.75 mm with a spatial resolution at nadir of 3.7 km. Using a variety of sensors, including the Scanning Radiometer (SR), Very High Resolution Radiometer (VHRR) and AVHRR sensors, snow cover has been mapped in the Northern Hemisphere on a weekly basis since 1966 by NOAA (Matson et al., 1986; Matson, 1991). Initially, the weekly NOAA National Environmental Satellite Data and Information System (NESDIS) operational product was determined from visible satellite imagery from polar-orbiting and geostationary satellites and surface observations. The analysis was performed once a week, using the most recent clear view of the surface. Because the analysis for this product was done only once a week, much snow cover, especially from fleeting/transient storms, was missed. Where cloudcover precluded the analyst's view of the surface for an entire week, the analysis from the previous week was carried forward (Ramsay, 1998). The maps were hand drawn, and then digitized using an 89 X 89 line grid overlaid on a stereographic map of the Northern Hemisphere. In 1997, the older, weekly maps were replaced in 1997, by the IMS product. The IMS product provides a daily snow map that is constructed through the use of a combination of techniques including visible, near-infrared and passive-microwave imagery and meteorological-station data at a spatial resolution of about 25 km (Ramsay, 1998 and 2000). Regional snow products, with 1-km resolution, are produced operationally in 3000 - 4000 drainage basins in North America by the National Weather Service using NOAA National Operational Hydrologic Remote Sensing Center (NOHRSC) data (Carroll, 1990 and Rango, 1993). Passive-microwave sensors on-board the Nimbus 5, 6, and 7 satellites and the Defense Meteorological Satellite Program (DMSP) have been used successfully for measuring snow extent at a 25- to 30-km resolution through cloud-cover and darkness since 1978 (Chang et al., 1987). Passive-microwave sensors also provide information on global snow depth (Foster et al., 1984). The NOAA/AVHRR and the DMSP Special Sensor Microwave Imager (SSM/I) are currently in operation. The Landsat Multispectral Scanner (MSS) and TM sensors, with 80-m and 30-m resolution, respectively, are useful for measurement of snow covered area over drainage basins (Rango and Martinec, 1982). Additionally, Landsat TM data are useful for the quantitative measurement of snow reflectance (Dozier et al., 1981; Dozier, 1984 and 1989; Hall et al., 1989; Winther, 1992). Reflectance of fresh snow is very high in the visible part of the electromagnetic spectrum, but decreases in the near-IR especially as grain size increases (O'Brien and Munis, 1975; Choudhury and Chang, 1981; Warren and Wiscombe, 1980; Warren, 1982). In addition, soot from industrial pollution becomes incorporated into the snowpack and this may decrease albedo and enhance snowmelt (Clarke and Noone, 1985; Warren and Clarke, 1985; Conway et al., 1996). Both because of natural aging and other factors (e.g. soot or volcanic ash deposition), the reflectance of snow decreases over time. Fresh snow can have a reflectance (integrated over the reflective part of the spectrum) up to about 80 percent but its reflectance may decrease to below 40 percent after snow crystals metamorphose. Snow, like all natural surfaces, is an anisotropic reflector (Salomonson and Marlatt, 1968; Dirmhirn and Eaton, 1975; Steffen, 1987; Nolin and Liang, 2000). The reflectance from snow is greatest in the forward direction and is largely specular. While freshly fallen snow can be nearly a Lambertian reflecting surface, as snow metamorphoses the specular component characteristic of forward scattering increases (Dirmhirn and Eaton 1975; Steffen, 1987). The formation of lake ice brings shipping and transportation on inland waterways to a standstill for several months every year in many northern areas. In addition to the impact on humans, the presence or absence of ice on lakes can have a major influence on the ecology of a region. The presence of ice can govern the viability of fish life in a lake, for example. Lake ice formation, thickness and break-up are also key indicators of regional climate especially in data-sparse regions which characterize much of the Arctic (Palecki and Barry, 1986). Lakes that freeze each winter are good indicators of regional climate change if key parameters such as the dates of freeze-up and break-up date and maximum ice thickness are measured over a decade-scale time frame. Some northern regions have experienced climate warming over the past few decades (or longer) as measured in the permafrost record and in meteorological records (Chapman and Walsh, 1993). Schindler et al. (1990) showed that air and lake temperatures in the Experimental Lakes Area of northwestern Ontario have increased by 2oC, and the length of the ice-free season has increased by 3 weeks, according to 20 years of observations. More recently, Magnuson et al. (2000) showed that lakes in the Northern Hemisphere have been freezing ~9 days later and melting ~10 earlier over the last 150 years. 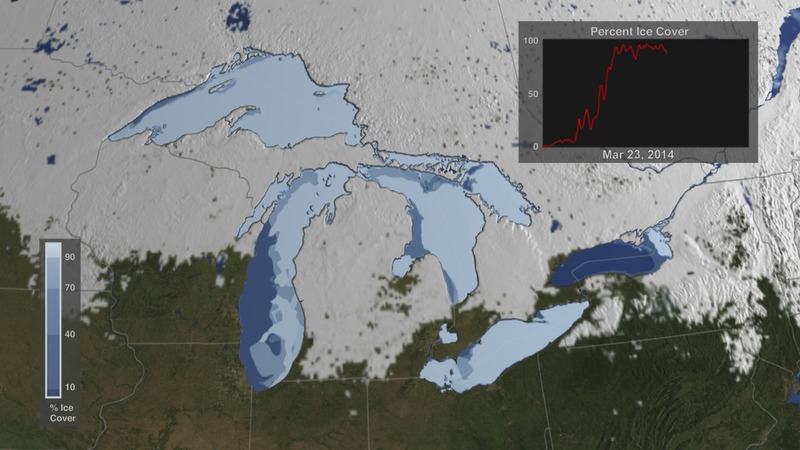 NOAA data have been used successfully to study lake ice on the Great Lakes. Because of the daily coverage of the NOAA satellites, data may be used operationally in spite of the fact that cloud-cover obscures the surface for much of the time. Ice conditions are also of interest because open water areas or large leads in the Great Lakes, for example, contribute moisture to feed major snow storms. Much work on the remote sensing of the Great Lakes has been accomplished (see Assel et al., 1994). Sea ice is an important component in the global climate system. Typically overlying approximately 7 percent of the world's oceans, sea ice experiences considerable seasonal variability in both hemispheres. In the Northern Hemisphere, the total extent of sea ice varies from a minimum of about 7.8 x 106 km2 in September to a maximum of about 14.8 x 106 km2 in March. In the Southern Hemisphere the extent varies from about 4 x 106 km2 in February to about 20 x 106 km2 in September (Parkinson et al., 1987). Sea ice significantly reduces the amount of solar radiation absorbed at the Earth's surface, greatly restricts exchanges of heat, mass, and momentum between the ocean and atmosphere, and affects the density structure of the upper ocean through the salt and heat fluxes associated with the freezing and melting processes. The changes in density structure at times lead to deep-water and even bottom-water formation, and the net equatorward advection of sea ice provides a transport of cold, low-salinity water out of the polar regions (Parkinson et al., 1987). Satellite remote sensing is a useful tool for mapping sea ice edges and ice concentration globally. A global year-'round record of ice-covered Antarctic and Arctic seas was acquired from the Electrically Scanning Multichannel Microwave Radiometer (ESMR) on Nimbus-5 following its 1972 launch (Zwally et al., 1983; Parkinson et al., 1987). Global maps of sea ice extent and concentration have been produced. The ability of passive-microwave instruments to collect data through cloud-cover and polar darkness makes them well suited for global monitoring of sea ice, but microwave instruments do not collect data on albedo or thermal-emitted energy from sea ice. Information on albedo and temperature is important during the spring-summer-autumn seasons to help analyze energy exchange of sea ice. Measurement of sea ice albedo and temperature are possible with optical sensors such as the AVHRR and Landsat TM (Lindsay and Rothrock, 1993; Key and Haefliger, 1992 and Key et al., 1997) and will be possible with MODIS. There is no ideal sensor for the comprehensive study of sea ice. Nor does a single sensor exist that is capable of measuring or monitoring the many characteristics of sea ice thought to be important to climate modeling and global change. Combinations of sensors must therefore be employed (Comiso et al., 1991). The passive-microwave satellite data from the DMSP/SSM/I are obtainable daily through cloud-cover and are useful for determination of ice type and concentration. The resolution of these data, which varies from about 15-30 km, is too poor for detailed studies of ice movement and lead structure. The imaging sensors on-board the Landsat and NOAA satellites are useful for ice movement and lead orientation studies, but all-too-frequently cloud-cover intervenes to reduce the utility of the acquired data. Synthetic Aperture Radar (SAR) data are unsurpassed among remote sensors for showing lead orientation, shear zones and drift patterns throughout the year, day or night. The ERS-1 and JERS-1 satellites with SARs on-board have already provided much additional important information about sea ice since the 1991 launch of ERS-1. ERS-2 and RADARSAT data are also beginning to provide both local and regional coverage of sea ice. However, SARs do not provide global coverage on a daily basis as is possible with passive-microwave, NOAA and future MODIS sensors. As it ages, newly-formed, smooth and thin sea ice is metamorphosed by temperature fluctuations, compressive and shear forces, surface currents and winds. In addition, the ice thickens and snow falls on top of the ice. Ridge formation and surface roughness increase with age, and the angular edges and smooth surfaces of first-year ice floes are transformed into rounded edges with hummocky, ridges and surfaces. Because the amount of heat exchange between the ocean and the atmosphere is influenced by the thickness of sea ice, it is important to be able to distinguish first-year and multi-year sea ice using satellite data. The surface temperature of first-year and multi-year sea ice is different during the winter until the first-year ice attains a certain thickness; these temperature differences, measured by AVHRR and MODIS, should aid in the determination of ice type. Key and Haefliger (1992) have shown that AVHRR thermal-IR data over snow covered sea ice can be used to measure ice surface temperature under clear-sky conditions. An important potential error in IST measurement occurs when ice crystal haze forms over the ice surface. Ice crystal haze can result in ice surface temperature errors of approximately 2o K. Research has shown that the IST retrieval algorithm of Key and Haefliger (1992) and Key et al. (1997) is reliable in the Arctic, and is accurate to 0.3 - 2.1° K.
Much additional relevant research has been conducted, and only a cursory background is given in this report. Additional relevant literature is available in many sources, including Rango (1993) for snow studies, and Barry (1986) and Carsey (1992) for sea ice studies. MODIS bands covering the visible through the IR parts of the spectrum (Salomonson and Toll, 1991) are used in the MODIS snow- and sea ice-mapping algorithms. MODIS bands 4, 6, 7, 13, 16, 20, 26, 31, and 32 may be used as inputs. Much has been written about the MODIS sensor characteristics, and detailed information may be accessed by studying the information on the following Web site: http://modis.gsfc.nasa.gov. Details regarding the instrument's technical specifications (including the bands) may be found at: http://modis.gsfc.nasa.gov, and MODIS calibration information may be found at: http://modis.gsfc.nasa.gov/MODIS/CAL/. The pertinent information for the snow and ice algorithms is that bands in the short-wave infrared parts of the spectrum (i.e., bands 6 (1.6 mm) and band 7 (2.1 mm)) that are excellent as snow/cloud discriminator bands. Its accuracy has been tested over a variety of surface covers relative to other derived snow cover maps; errors had been estimated for seven different land covers using Landsat thematic mapper and MODIS Airborne Simulator data prior to the MODIS launch. It runs automatically, without human intervention. It can be employed globally. It is straightforward, computationally frugal, and thus easy for the user to understand exactly how the product is generated. While other algorithms may have greater accuracy at the regional and local scales, they do not fulfill the requirements relative to computer usage, automation and ability to map snow and ice globally. Snow has strong visible reflectance and strong short-wave IR absorbing characteristics. The Normalized Difference Snow Index (NDSI) is an effective way to distinguish snow from many other surface features. Both sunlit and some shadowed snow is mapped effectively. A similar index for vegetation, the Normalized Difference Vegetation Index (NDVI) has been proven to be effective for monitoring global vegetation conditions throughout the year (Tucker, 1979 and 1986). Additionally, some snow/cloud discrimination is accomplished using the NDSI. Other promising techniques, such as traditional supervised multispectral classifications, spectral-mixture modeling, or neural-network analyses have not yet been shown to be usable for automatic application at the global scale. They are also computationally intensive. Training or the interaction of an interpreter are required for successful application of techniques such as neural-network analysis. These techniques may progress to regional applications and possibly even global application in future years. In the post-launch time frame, if neural-network and/or spectral-mixture or other analysis techniques can be used to 'train' on the entire globe using MODIS data, then one of these methods might be implemented to map global snow and ice cover. The snow-mapping algorithm, Snowmap (Hall et al., 1995; Klein et al., 1998; Hall et al., in press), is designed to identify snow if present in each 500-m pixel for each orbit. A global, daily snow product will be produced. An 8-day composited snow cover product will be generated by compositing successive days of snow cover products. This will yield maximum snow extent for the 8-day period. If a pixel were snow covered on any orbit during that period, then that pixel will be mapped as snow covered even if it were snow-free on all of the other orbits during the 8-day period. Other coverage and persistence statistics will also be included to assist analysis of the data product. Summary statistics and quality assurance (QA) data will be included as metadata. There has been much discussion concerning the optimum compositing period for the snow and ice maps (e.g. see Hall et al., 1995). While weekly composites would correspond with the NOAA/NESDIS maps and the NOHRSC maps, some modelers are interested in longer compositing periods, e.g., 7 days to one month. 8-day composites were chosen because this period optimizes the ground coverage from the MODIS instrument. The repeat period of the satellite is 16 days. If a researcher wants to produce a composited product for any period other than a 8-day period, from our daily product, this can be done using the daily data. Pixels that are approximately 50% or greater covered by snow have been found to have NDSI values ³ 0.4 in our testing of a TM scene of the Sierra Nevada, California. Since water may also have an NDSI ³ 0.4, an additional test is necessary to separate snow and water. Snow and water may be discriminated because the reflectance of water is <11% in TM band 4. Hence, if the reflectance of TM band 4 >11%, and the NDSI ³0.40, the pixel is initially considered snow covered. These NDSI thresholds have been verified from detailed analysis of numerous TM scenes, comparisons with supervised-classification techniques and comparison of a Snowmap-derived map of the 10 May 1992 TM scene of the Sierra Nevadas with a snow map derived from Rosenthal and Dozier (1996). Pure snow has a high NDSI but NDSI decreases as other features are mixed in a pixel. Snow in mixed pixels has an NDSI that is less than that for pure snow. Pure snow can be distinguished by its high NDSI value. In forested locations, many snow covered pixels have an NDSI lower than 0.4. To correctly classify these forests as snow covered, a lower NDSI threshold is employed. The normalized difference vegetation index (NDVI) and the NDSI are used together in order to discriminate between snow-free and snow covered forests. Forested pixels have higher NDVI values compared with non-forested pixels. Thus by using the NDSI and NDVI in combination, it is possible to lower the NDSI threshold in forested areas without compromising the algorithm performance in other land covers. The NDSI-NDVI field is designed to capture as much of the variation in NDSI-NDVI values observed in the snow covered forests as possible while minimizing inclusion of non-forested pixels. It was designed to include forest-covered pixels that have NDSI values lower than 0.4, yet have NDVI values lower than would be expected for snow-free conditions (Klein et al., 1998). Last, a threshold of 10% in TM band 2 was used to prevent pixels with very low visible reflectances, for example black spruce stands, from being classified as snow as has previously been suggested (Dozier, 1989). Snowmap uses at-satellite reflectances in MODIS bands 4 and 6 to calculate the NDSI. A pixel will be mapped as snow if the NDSI value is ³ 0.4 and the reflectance in MODIS band 2 is >11%. However, if the MODIS band 4 reflectance is <10%, then the pixel will not be mapped as snow even if the other criteria are met. In addition, MODIS reflectances in bands 1 and 2 will be used to calculate NDVI to permit mapping snow in forests. If a pixel has NDSI and NDVI values within an irregular polygon as determined from canopy-reflectance modeling as discussed in Klein et al., 1998 it is mapped as snow. Snow/cloud-discrimination techniques are based on differences between cloud and snow/ice reflectance and emittance characteristics. Clouds are highly variable and may be detected by their generally-high reflectance in the visible and near-IR parts of the electromagnetic spectrum (Rossow and Garder, 1993), whereas the reflectance of snow drops in the short-wave infrared part of the spectrum. While the NDSI can separate snow from most obscuring clouds, it does not always identify or discriminate optically-thin cirrus clouds from snow. Analyses of TM and MAS data show that Snowmap can map snow under cirrus clouds at least some of the time. 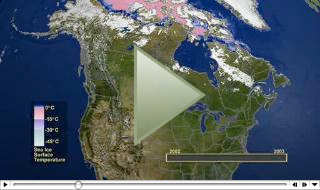 Clouds are masked by using the MODIS cloud masking data product. Originally, the summary result of the cloud masking algorithm stored in the unobstructed FOV quality flag was used. If that flag was set to "certain cloud," then the pixel was labeled as cloud obscured in the snow map. Analysis of the snow maps in many locations and situations led to a refinement in the use of cloud test results stored in the cloud mask product. It was discovered that the brightness temperature difference (BT 3.7 mm - BT 11 mm) test, stored in "bit 19" of the cloud mask product, provided a reasonable and improved cloud mask for snow mapping. Justification was written in August 2001 to request a change in the snow algorithm in the 2001-02 snow. In this report, "Request to Update the MODIS Snow Algorithm Code," examples of the use of that cloud test from the cloud mask are given. One of the problems facing the MODIS snow-mapping algorithm is the mapping of snow in regions where it is known not to exist. One of the more common locations for this problem is in dark, dense forests, particularly in the tropics. The nature of the snow-mapping algorithm is such that it is particularly sensitive to small changes in the NDSI or NDVI over dark, dense vegetation. To correct false-snow mappings in tropical forests, the 11.03µ m thermal-infrared band (MODIS band 31) was used to estimate the surface temperature. This band was selected because it represents an atmospheric window, in which little of the emitted thermal radiation is absorbed by the atmosphere. A tentative threshold of 277 K has been set. When this threshold is applied in tropical regions, e.g., the Congo, it eliminates from 93% to 98% of the false snow (see Barton et al., unpublished). Snow anisotropy may also result in some errors when mapping snow at larger view angles. Snow is not a Lambertian reflector and tends to reflect more in the forward direction, especially when the snow is aged. The increase in forward scattering with snow age is also greater in the near infrared relative to the visible. At view angles greater than around 30° off nadir, the reflectance will differ slightly from that at nadir, as the amount of reflected solar irradiance will vary with view angle due to the anisotropy of snow. Results suggest that the change may be significant, and a scan-angle correction has been included. However, recent results using the thermal mask indicate that the scan-angle correction may not be necessary. There is a weak relationship between scan angle and the presence of false snow, with more false snow mapped at higher scan angles. Numerical tests show that from 35% to 60% of the snow in a given scene can be found at scan angles greater than 45°. It is also observed in the data that almost all of the false snow is mapped on the sunward side of the sensor. This phenomenon is probably due to forward scattering off of various atmospheric or ground-level agents. For these reasons, the scan angle threshold could be set at 45° on the sunward side, and at the maximum, 55°, looking away from the sun. Tests using the 11.03µm thermal emissivity band and the scan angle of the MODIS sensor in central Africa suggest that these parameters can be used to eliminate approximately 99% of false snow mapped in these tropical regions. It remains to be seen if these tests can be successfully applied globally, and in particular in areas where snow actually exists. For more details on the algorithm enhancements, see Barton et al., unpublished, 2001: "Thermal and geometric thresholds in the mapping of snow with MODIS." Lake ice is mapped along with, and as part of, the snow cover product. Ice is mapped in the following large inland water bodies: Lake Superior, Lake Michigan, Lake Erie, Lake Huron, Lake Ontario, Great Bear Lake, Great Slave Lake, Lake Winnipeg, Lake Athabaska, Lake of the Woods, Lake Sakami, Lake Nipigon and Reindeer Lake in North America; Lake Vanern, Lake Ladoga, Lake Baikal, Lake Peipus, Lake Balkhash and Onega Lake in Eurasia. 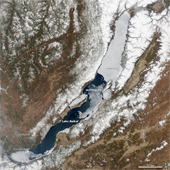 Thus far, no specific work has been done by the MODIS snow and ice project on lake ice studies. This is a topic that will be studied more in the future. Icemap is designed to identify the presence of sea ice in each 1-km pixel for each orbit and to calculate the IST. Daily and 8-day composited sea ice extent will be produced in the Product Generation System (PGS). If sea ice is present in any pixel on any day during the 8-day compositing period, that pixel is considered to be ice covered. Icemap was designed to run automatically. A grouped-criteria technique using criterion tests and decision rules for identifying sea ice are modified versions of those used for Snowmap. Land and clouds are masked using the land/water mask in the MOD03 product and the MODIS cloud-mask product. The algorithm generates a sea ice extent map from reflectance data acquired during daylight and generates IST both day and night from thermal data. Measurements collected by researchers over the range of 0.4-2.4 mm show that the albedo of sea ice changes over the seasons (Grenfell and Perovich, 1984). Snow covered sea ice has albedo characteristics similar to snow, thus logic similar to that used to identify snow cover can be used to identify snow covered sea ice. As snow melts on sea ice, the albedo decreases across all wavelengths (Grenfell and Perovich, 1984). Open ocean typically has a very low albedo, in contrast to the highly-reflective sea ice. Some types of sea ice, such as grease ice, however, may be difficult to identify with such criteria tests because they lack sharp contrast with open ocean. Characteristics of areal extent, albedo, thickness of sea ice, ice margins, leads, ice types, motion and concentration, are important to measure as they may be used in energy-balance models (e.g. Barry, 1986). The primary contribution of the MODIS sea ice algorithm to the study and monitoring of sea ice will be the ability of MODIS data to provide some ice information at high spatial resolution (1 km) to augment the data provided by passive- and active-microwave sensors, and to map IST. Additionally, the ability to measure surface temperature in the winter, using MODIS data, should aid in the determination of ice type, and will be useful for estimating radiative and turbulent heat fluxes for large-scale climate studies. The MODIS sea ice algorithm identifies sea ice by its reflectance characteristics in the visible and near IR and its sharp contrast to open water. The algorithm also estimates the IST, which is used as an additional discriminatory variable for the identification of sea ice cover. The darkness of polar winters will be a limiting factor in the use of visible channels. Cloud cover in the central Arctic Basin will be a limiting factor in mid-summer (Grenfell and Perovich, 1984) especially in the daily maps. Because the 8-day composite maps will be developed, it is expected that sea ice can be mapped during the spring, summer and autumn when the greatest changes are taking place in the extent and movement of sea ice. Winter sea ice mapping may be possible if the cloud-masking algorithm works well in polar darkness. Snow covered sea ice is determined using the following criteria. If the NDSI ³ 0.4 and the visible reflectance (using MAS channel 1) > 0.11, then the pixel contains snow covered sea ice. These criteria are the same as used by Snowmap. Relatively thin sea ice (< 10 cm, with no snow cover) which has a lower albedo and which may not be detected using the NDSI, is identified using the difference between ice surface and sea surface temperature (Riggs et al., 1999). Details of the IST algorithm follow this section. MODIS thermal IR bands (31 and 32) are used for mapping sea ice surface temperature and, together with the NDSI, for estimating sea ice extent. The surface temperature of open water is assumed to be > 271.4 K while the surface temperature of saline ice is £ 271.4 K. This value was determined from estimates of open water and ice obtained from MAS images in the Beaufort Sea, near St. Lawrence Island, Alaska. The basis of the MODIS IST algorithm is the work of Key et al. (1997). Key et al. (1997) state that the demonstrated accuracy of the algorithm is sufficient for most climate process studies. The major caveat with the algorithm is that it is applicable only to clear-sky conditions; inadequate cloud masking may result in significant error in estimating the IST. The heritage of the technique is Key and Haefliger (1992) with substantiation of robustness and accuracy by later work (Key et al., 1994; Yu et al., 1995; Lindsay and Rothrock, 1994; Massom and Comiso, 1994). Key and Haefliger (1992) used the following equation to determine IST for snow covered sea ice in the central Arctic under clear sky conditions. a, b, c, d -- empirically-determined coefficients for atmospheric effects, notably humidity. Equation  given by Key et al. (1997) is reported by them to be superior to that of . Linking the coefficients to temperature ranges also provides greater flexibility in application of the algorithm (Key et al., 1997). Equation  is suitable for use with MODIS thermal data. MODIS Level 1B data for the thermal IR channels (31 and 32) are stored as calibrated radiance data. The radiance data are converted to brightness temperature by inversion of Planck's equation. Equation  can then be applied to determine IST. The IST algorithm (Eq. 4) is only valid for clear-sky conditions. Any cloud contamination may cause significant errors in calculation of IST. The MODIS cloud masking product will be utilized to identify clear-sky conditions; only pixels with a 95% or greater probability of being unobstructed by cloud will be considered. Other pixels will be identified as cloud contaminated. Furthermore, it is recognized that even under clear-sky conditions, water vapor will affect the accuracy of the IST calculation. There is likely to be more water vapor in the boundary layer when melt ponds and leads are present, but this is handled by the algorithm automatically. The coefficients are primarily used to correct for atmospheric water vapor. The primary difficulty with surface temperature retrieval occurs when melt ponds and leads are present. The emissivity over water will be somewhat lower than that of snow or ice, say 0.96 compared to 0.99. This will make a difference of a few tenths of a degree (Jeff Key, written communication, 1996). The directional effects are also probably slightly different in melt ponds and leads as compared to snow- or ice-covered sea ice. Snow/cloud discrimination techniques are based on differences between cloud and snow/ice reflectance and emittance characteristics. Clouds are highly variable and may be detected by their generally-high reflectance in the visible and near-IR parts of the electromagnetic spectrum (Rossow and Garder, 1993), whereas the reflectance of snow drops in the short-wave infrared part of the spectrum. Cloud masking for both daytime and nighttime conditions are included in the algorithm. Clouds are masked by using the MODIS cloud-masking data product. The summary result of the cloud-masking algorithm stored in the unobstructed FOV quality flag is used. If that flag is set to "certain cloud" then the pixel is labeled as cloud obscured in the sea ice map, and IST is not calculated. Analysis of the sea ice product and associated analysis of the cloud mask has revealed that the cloud mask algorithm performance is very different between daylight and darkness. In daylight, the cloud mask has been cloud biased resulting in greater cloud coverage than may exist and identifies sea ice as cloud in many situations. In darkness, the cloud mask has been biased toward identifying clear conditions, resulting in a lack of cloud coverage when there probably is some. Usage of the cloud mask in the sea ice algorithm is being actively investigated. Sea ice identification does not have many of the complicating factors of varying surface covers that affect snow mapping, but there are complications that make sea ice mapping difficult. Because sea ice can vary in concentration from near zero to 100 percent, sea ice can give different reflectances and surface temperatures even within a scene, due to mixed-pixel effects. Sea ice can also have different reflectances depending on snow cover and the presence of surface melt ponds. The presence of melt ponds and leads in the summer months will also affect the emissivity of the ice surface and therefore the calculation of ice surface temperature. The accuracy of the IST is in the range of 0.3 - 2.1° K (Key et al., 1997). An expected accuracy for the MODIS IST product will be based on accuracies reported in Key and Haefliger (1992), Lindsay and Rothrock (1994) and Key et al. (1997), and on investigation with MODIS Airborne Simulator data, which should allow us to define the expected accuracy for the MODIS IST. The coefficients of Key et al. (1997) were used in the MODIS IST algorithm. The coefficients were modified based on MODIS-specific calculations done by Key (2000) and integrated into the sea ice algorithm in March 2000. Further analysis of IST results may result in changes to the coefficients. Clouds pose many of the same problems in mapping sea ice as they do when mapping snow. Sea ice may move relatively rapidly and clouds may obscure this movement or make the movement of the sea ice appear incoherent when a 8-day time series, partially obscured by clouds, is compiled. Small ice floes, polynyas, and leads at subpixel resolution contribute error to identification and mapping of sea ice. Global error analysis will be accomplished with other sources of data, e.g. passive-microwave and regional operational sea ice data products, to estimate error at regional and global scales in the post-launch time period. More detail concerning the MODIS sea ice mapping algorithm may be obtained from the following publication: Riggs et al., 1999: "Sea ice extent and classification mapping with the Moderate Resolution Imaging Spectroradiometer Airborne Simulator," Remote Sensing of Environment, 68:152-168. The Level-3 snow and sea ice data products are generated and gridded to the integerized sinusoidal grid, and a polar-stereographic map grid (EASEGrid), respectively. sinusoidal projection common to the MODIS land group, at 500-m resolution. The sea ice maps will be re-gridded to a polar-stereographic map projection at 1-km resolution. Snow and sea ice products at ~5.6-km resolution will also be produced on a latitude/longitude grid known as the climate-modeling grid (CMG). It is hoped that the CMG products will be produced by MODAPS sometime during the 2001-2002 winter in the Northern Hemisphere. But the snow and ice project will generate the 8-day composite CMG snow-cover maps in HDF-EOS format and they will be provided to NSIDC and any researchers who request them, through our Web site beginning in the fall 2001. 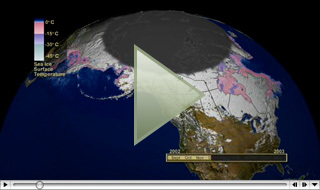 There were two types of climate model simulations performed by Dr. Glen Liston of Interworks Consulting, to test the application of the MODIS-SNOWMAP, 1/4 degree by 1/4 degree, climate model grid (CMG) snow-covered fraction data sets: first, the climate model simulated its own snow-cover distribution (equivalent to most current modeling practices), and second, the fractional snow-covered area was defined for each climate model grid cell using MODIS-SNOWMAP CMG information. The differences between the two simulations were analyzed. Since Dr. Liston's work was done, we now have 5-km global data sets available for use in future simulations. The results of these simulations were used to make recommendations regarding how the MODIS-SNOWMAP products can be used within the context of regional and global weather and climate models. The work was also used to test and quantify the value of MODIS-SNOWMAP products, and point to potential improvements in the data products for atmospheric and hydrologic applications. A snow albedo algorithm has been developed for the Moderate Resolution Imaging Spectroradiometer (MODIS) by Dr. Andrew Klein/Texas A&M. The algorithm will complement existing MODIS products by providing albedo measurements for areas mapped as snow on a global daily basis by MODIS. Short-wave radiation provides a major energy source for the melting of snow and ice, therefore accurate estimates of the extent of snow and sea ice and the albedo of these surfaces are vital inputs into snowmelt and sea ice models. Compared to other surfaces, both snow and sea ice are highly reflective and their albedo strongly influences surface energy fluxes. Their high albedo strongly influences the Earth's radiation budget (Foster and Chang, 1993) making adequate knowledge of snow and sea-ice extent important inputs into global climate models and surface-atmosphere transfer schemes. In addition to having one of the highest albedos of all naturally-occurring surfaces, the albedo of snow-covered surfaces varies considerably over relatively short time periods. Sea ice can be expected to change on similar or shorter time-scales. To adequately capture the temporal changes in these high albedo surfaces, frequent temporal sampling, preferably daily, is required. Satellite observations are the most efficient means of documenting the albedo of both snow and sea ice over large areas. The Moderate Resolution Imaging Spectroradiometer (MODIS) is especially well suited for this task as it will image mid-to-high latitude snow-covered areas on a daily basis. Compared with currently operational polar orbiting environmental satellites, MODIS offers cloud detection, higher spatial and finer spectral resolution. The Prototype MODIS Snow Algorithm algorithm builds heavily on a number of recently developed algorithms that estimate the albedo of both snow (Knap and Oerlemans, 1996; Stroeve et al., 1997) and sea ice (De Abreau et al., 1994; Schweiger et al., 1993). This previous research, particularly that which has focused on the development of albedo algorithms for the Advanced Very High Resolution Radiometer (AVHRR) instrument, forms a solid basis for the construction of a similar algorithm for MODIS. These approaches are being adapted for use with the MODIS instrument with the goal of designing a state-of-the-art, yet readily comprehensible, algorithm capable of producing an albedo estimate from a single MODIS observation. Since the Terra Spacecraft was not launched until December 19, 1999, initial algorithm prototyping efforts were accomplished using MODIS Airborne Simulator (MAS) data acquired over Wisconsin and New York during January and February 1997. Current validation efforts are ongoing using MODIS data acquired over the Great Plains and Greenland. The algorithm has undergone initial validation through comparisons with broadband albedo measurements made at the NOAA SURFRAD site in Fort Peck, Montana. In situ SURFRAD albedo measurements have compared to daily MODIS snow albedo retrievals for the period from November 21 to 26, 2000 using five different five narrow-to-broadband albedo conversion schemes. Generally, the prototype MODIS algorithm produces reasonable broadband albedo estimates. Maximum daily differences between the five MODIS broadband albedo retrievals and insitu albedo is 15 percent. Daily differences between the 'best' MODIS broadband estimate and the measured SURFRAD albedo range from 1 to 8 percent. However, no single conversion scheme consistently provides the closest albedo estimate. As with the other MODIS snow products, correct cloud masking remains problematic. The comparisons at the Fort Peck site are continuing. The time series of MODIS snow albedo estimates is being extended to allow comparisons over a larger range of solar zenith angles and snow conditions. Further validation is planned for Greenland and other North American sites where broadband albedo measurements are routinely made. Further validation and algorithm development using data from North American and Greenland is ongoing. Currently, the algorithm's primary input is the MOD09 daily surface reflectance product. The snow albedo algorithm provides an albedo estimate for the 'best' MODIS observation of snow-covered pixels each day. The MOD09 surface reflectances are adjusted to account for the bi-directional reflectance of snow using a discrete ordinates radiative transfer (DISORT) model are used to correct for anisotropic scattering effects over non-forested surfaces. A narrow-to-broadband conversion scheme is then used to create an integrated broadband albedo. The snow and ice albedo algorithm is scheduled to be integrated into the existing MODIS snow algorithm in the fall of 2001. The following papers have been written on the proposed MODIS snow and ice albedo product: Klein, A.G., in press: Development of a prototype snow albedo algorithm for the NASA MODIS instrument, Proceedings of the 57th Eastern Snow Conference, 17-19 May 2000, Syracuse, NY, pp., and Klein, A.G., in press, "Development and validation of a snow albedo algorithm for the MODIS instrument," Annals of Glaciology, 34. MODIS-derived snow maps will continue to be compared with snow cover maps generated by NOAA from the IMS. 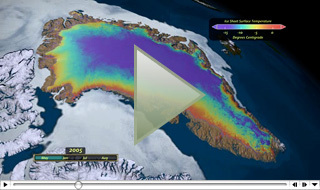 The techniques used by NOAA and the snow and ice data sets they generate are used for validation of MODIS snow and sea ice products. The NOAA snow mapping systems make use of the AVHRR band 3A (1.6 mm) on NOAA 15. NOAA experience for snow/cloud discrimination with satellite data at 1.6 mm will be drawn upon for refinement of Snowmap. Close collaboration with the NOAA/NESDIS group is maintained for exchange of ideas and algorithms for snow cover mapping and validation. NOAA/NOHRSC snow cover maps are also used for validation purposes and communication with the NOHRSC is maintained. In addition, comparisons will be made between MODIS maps and maps derived from Scanning Multichannel Microwave Imager (SSM/I) data, if available, or Advanced Microwave Scanning Radiometer (AMSR) data after the launch of the first EOS-Aqua platform in 2002. Comparison of Snowmap results with these independently-produced snow data sets will allow errors to be identified that will permit us to determine the accuracy of the global maps relative to one another. There are several hemispheric-scale satellite-derived snow-cover maps available, but none has been fully validated. For the period October 23 - December 25, 2000, we compared MODIS Level-2 and Level-3 snow maps of North with NOAA IMS and National Operational Hydrologic Remote Sensing Center (NOHRSC) maps. We also compared MODIS maps with Defense Meteorological Satellite Program (DMSP) Special Sensor Microwave/Imager (SSM/I) passive-microwave snow maps for the same period. The maps derived from visible and near-infrared data are more accurate for mapping snow cover than are the passive-microwave-derived maps, however discrepancies exist as to the location and extent of the snow cover even between operational snow maps. Analysis of the swath (Level 2) and daily (Level 3) MODIS snow cover maps with the operational maps for daily and 8-day periods within that period revealed that MODIS mapped more snow than do the NOHRSC maps, in part, because MODIS is mapping the effects of fleeting snow storms due to its frequent coverage. The large (~30 km) footprint of the SSM/I pixel, and the difficulty in distinguishing wet and shallow snow from wet or snow-free ground, reveal differences up to 5.32 million km2 in the amount of snow mapped using MODIS versus SSM/I data. Algorithms that utilize both visible and passive-microwave data, which would take advantage of the all-weather mapping ability of the passive-microwave data, will be refined following the launch of the Advanced Microwave Scanning Radiometer (AMSR) in the fall of 2001. A paper on this topic entitled, "Assessment of the relative accuracy of hemisphere-scale snow maps," by D.K. Hall et al. (in press) was presented at the International Glaciological Society Fourth International Symposium on Remote Sensing of Ice and Snow, June 4-8, 2001, in College Park, Maryland, and has been accepted for publication in the Annals of Glaciology. A significant limitation in mapping the extent of snow cover occurs in situations of mixed pixels where snow cover is obscured by dense forest cover. The snow covered forested landscape is actually never completely snow covered because the tree branches, trunks and canopies often do not get or stay snow covered. Often, in boreal forests, snow that falls on the coniferous tree canopy will not stay on the canopy for the entire winter due to sublimation. Thus, even in a continuously snow covered area, much of the forested landscape will not be snow covered. It may be very difficult, even with field measurements and high-resolution air photos, to determine what percentage of the area is snow covered. Additionally, when viewing at off-nadir angles such as the angles up to ±45° that we plan to use with the MODIS sensor, the tree branches, canopies, etc., will obscure even more of the snow than when viewing at near-nadir angles. Much of the Earth's land surface is covered by dense forests. The boreal forest, the forest that stretches across the northern part of North America and Eurasia, is a prime example. Snow accumulates to greater depths and melts later in the spring in the boreal forests than in adjacent tundra or prairie areas (Foster et al., 1991). Though the boreal forests are always snow covered in the winter, within dense forests, snow that falls onto the ground through the canopy may not be visible from above. Some snow stays in the tree canopy and may thus be visible, but the snow often does not stay in the canopy during the entire winter. Snow in trees often sublimates before falling to the ground. A relatively simple canopy reflectance model for discontinuous canopies (GeoSAIL), was used to determine the fraction of sunlit crown, sunlit background, shadowed crown, and shadowed background within a forest stand. It was also used to model the crown reflectances and the transmittance through the canopy. Reflectances for the sunlit snow were calculated using the Wiscombe and Warren (1980) model and the reflectances of the other components were taken from direct measurements. The objective of the study was to estimate how the presence of snow on the forest floor would alter the reflectance of a forest stand. The primary change in reflectance occurs in the visible wavelengths as snow has a much higher visible reflectance than soil, leaves, or bark. Depending upon the vegetation type, snow may also cause a decrease in the mid-infrared reflectance of the stand. This behavior is captured in the NDSI. In addition, the reflectance in the visible will often increase with respect to the near-infrared reflectance. This change lowers the normalized difference vegetation index (NDVI). Therefore, taken together the NDVI and NDSI provide a strong signal that can be exploited to classify snow covered forests (Klein et al., 1998). One additional problem occurs in detection of snow under certain forest types. Many forest types, most notably black spruce, have very low reflectances in the 1.6 mm wavelength region (TM band 5). These low reflectances cause the denominator in the NDSI to be quite small, and only small increases in the visible wavelengths (e.g. TM band 2) are required to make the NDSI value high enough to classify a pixel as snow. For instance, if the short-wave infrared reflectance in 5%, then it may only take a visible reflectance of 12% for the NDSI to exceed 0.4. This problem is exacerbated when the NDSI-NDVI threshold is employed, as lower NDSI values will be classified as snow. To limit errors of commission, a visible threshold is used to prevent pixels with very low visible reflectances from being classified as snow as has previously been suggested by Dozier (1989). Here a threshold of 10% in TM band 2 was used. Landsat TM band 2 was selected over TM band 1 because the effects of Rayleigh scattering are greater at shorter wavelengths. For more information on how the correction for mapping snow in densely-forested areas was developed and tested, see Klein et al., (1998): Improving snow cover mapping in forests through the use of a canopy reflectance model, Hydrological Processes, 12:1723-1744. In April 1995, the MODIS Airborne Simulator (MAS) on-board the ER-2 aircraft was deployed to image snow cover in Alaska and sea ice in the Bering Sea in conjunction with snow ground truth data collection. Also on-board was the Millimeter Wave Imaging Radiometer (MIR) instrument, which acquires images in the microwave part of the spectrum. U.S. Army Cold Regions Research and Engineering (CRREL) and University of Alaska (Matthew Sturm and Carl Benson, respectively) scientists collaborated on analysis of the field and aircraft measurements. An objective of the mission was to determine the accuracy of mapping snow in different surface covers. The surface cover in this area of central Alaska is typically spruce, birch, aspen, mixed forest, and muskeg. A vegetation density map was constructed using MAS data acquired on 4/13/95 (Hall et al., 1998). In regions having a vegetation-cover density of < 50%, Snowmap mapped 99% snow cover. These areas are generally composed of muskeg and mixed forests including frozen lakes. In the part of the scene that was estimated to have a vegetation-cover density ³ 50%, Snowmap mapped 98% snow cover. These areas are generally composed of dense coniferous or deciduous forests. Without the NDVI component included in the Snowmap algorithm, only 71% of the snow cover was mapped in the forests. This work is described fully in the following journal articles: D.K. Hall et al., 1998: Assessment of snow-cover mapping accuracy in a variety of vegetation-cover densities in central Alaska, Remote Sensing of Environment, 66:129-137; and D.K. Hall et al., 2000: Intercomparison of satellite-derived snow-cover maps, Annals of Glaciology, 31:369-376. It is recognized that Snowmap will perform better in some land covers than in others. Specifically, in tundra and prairie areas, and over large lakes, the errors in snow mapping will be very low. Results using the Snowmap algorithm with TM and MAS data over these areas show 100 percent snow cover was mapped when they were known by field measurements to be 100 percent snow covered. In forested areas, errors may be much larger. An estimate of the errors inherent in using Snowmap in different land covers has been made using data from focused field and aircraft missions, for example: agricultural (e.g. in the upper midwest of the U.S.), alpine (e.g. Glacier National Park, Montana), forest (e.g. the Boreal Forest in Saskatchewan), prairie (e.g. the Great Plains in eastern Montana) and tundra (e.g. the North Slope of Alaska) (Hall et al., 1998). Errors have been determined for the following 7 land covers: forests, mixed agriculture and forest, barren/sparsely-vegetated, tundra, grassland/ shrubland, wetlands, and snow/ice. These land covers were selected because they cover a wide range of conditions encountered in snow covered parts of the Earth. The maximum expected MODIS snow-mapping errors for these 7 land-cover types are 15% for forests, 10% for mixed agriculture and forest, and 5% for other land-covers (Hall et al., 2001). Estimating snow cover is most difficult in forests, because the trees partially or completely conceal the underlying snow. These errors were used to estimate the expected maximum monthly and annual errors in Northern Hemisphere snow mapping using Snowmap. The maximum monthly errors are expected to range from 5-9% for North America, and from 5-10% for Eurasia. The maximum, aggregated Northern Hemisphere snow-mapping error is expected to be about 7.5%. The error is expected to be highest (around 9-10%) when snow covers the Boreal Forest, roughly between November and April. These error estimates will be refined with use of the MODIS land-cover product after it is validated. Two non-EOS datasets were used to determine the above errors. 1) The 1-km IGBP digital land-cover maps of North America and Eurasia were used to identify the 7 cover types discussed above (there are 17 land covers in the IGBP map). 2) The average monthly snowline positions were obtained from the NOAA National Environmental Satellite, Data and Information Service (NESDIS). The snowline positions were registered to the land-cover maps and the percent of each of the 7 land covers north of the continental snowline was calculated monthly for North America and Eurasia. Snowmap errors derived from each of the land covers from aircraft experiments were extrapolated to the continental scale. Details of the snow-mapping error determination based on land-cover type may be found in D.K. Hall et al. (2001): Development of a technique to assess snow-cover mapping errors from space, IEEE Transactions on Geoscience and Remote Sensing, 39(2):432-438. The combined use of visible, near-IR, short-wave IR and microwave sensors to map snow will lead to an ability to map snow extent, albedo, water equivalent, and sea ice concentration. Because passive-microwave sensors are generally unaffected by cloud-cover over snow- and ice-covered areas, it will be advantageous, in the EOS era after the launch of the EOS Aqua platform, to use MODIS data in conjunction with Advanced Microwave Scanning Radiometer (AMSR) data to map snow extent and depth globally. Algorithms are currently being developed which combine AVHRR and SSM/I data, to more accurately map snow cover. These algorithms will be modified to use MODIS and AMSR data when these data become available. Also, the Advanced Microwave Sounding Units (AMSU-A and AMSU-B) aboard the NOAA-K satellite will be used for validation. Many of our pre-launch validation efforts deal with combining the optical and passive-microwave data. For example, the Alaska 1995 and WINCE 1997 missions had the Millimeter-wave Imaging Radiometer (MIR) as well as the MAS on board (Tait et al., in press (a) and (b)). Passive-microwave data have been used to map Northern Hemisphere snow cover at a resolution of up to 30 km since 1978 even through darkness and cloud-cover. The passive-microwave data also provide an estimate of snow-water equivalent in many areas. Parameters affecting the passive-microwave response of snow include: water equivalent, density, grain size, temperature, surface roughness, forest-cover fraction and forest type. Problems inherent in the interpretation of the data include: the coarse resolution is not suitable for most regional snow studies, in densely-forested areas algorithms underestimate snow-water equivalent, and derivation of snow-water equivalent is dependent upon snow and land-cover characteristics. Similarly, passive-microwave data have been used to map sea ice extent and concentration. In the future, with AVHRR data from NOAA-K and beyond, and with MODIS data, optical data can be used to provide detail that passive-microwave data cannot, including IST, when conditions are clear. Used in synergy, optimum sea ice information will be possible. From 31 March to 25 April, 1995, a mission was conducted to study snow cover in northern and central Alaska, respectively (Hall et al., 1996; Tait et al., in press (a)). The utility of high frequency passive-microwave aircraft data was examined, as was the influence of a variety of surface cover types on the microwave brightness temperatures of dry and melting snow. The aircraft data included the Millimeter-wave Imaging Radiometer (MIR) and the MODIS Airborne Simulator (MAS). The MIR is a mechanically-scanned imaging microwave radiometer that measures radiation at the following frequencies: 89, 150, 183.3±1, 183.3±3, 183.3±7 and 220 GHz. It has an angular resolution of about 3.5°. It is a cross-track scanner with an angular swath width of about 100°, centered at nadir. Its polarization vector is in the horizontal plane and perpendicular to the velocity vector of the aircraft so that the measured radiation is a mixture of vertical and horizontal polarizations depending on the viewing angles. The temperature sensitivity is £ 1 K for all channels. The MIR data in this study have a spatial resolution of approximately 1 km at nadir. Field measurements of snow depth, density, grain size and shape were made in Fairbanks (64°50'N, 147°48'W) and at Ester Dome which is about 5 km northwest of Fairbanks, as well as in other parts of Alaska. Aircraft flight lines were flown in a grid pattern in central Alaska, including Fairbanks, on 5, 6, 13 and 21 April. The MAS data were scaled to the MIR resolution, and vegetation data (Kuchler, 1985), were also re-projected. Field and air-temperature measurements showed that the snow in and near Fairbanks was melting during the daytime during the month of April. Except within the city, snow cover was nearly continuous. Table 3 shows snow depths from a location in Fairbanks and at Ester Dome. Table 4 shows air temperatures at the approximate time of the aircraft takeoff on the flight days over the 'Fairbanks grid.' Each flight over the Fairbanks grid lasted about 2 hours and 20 minutes. Snow in Fairbanks was actively melting during the daytime during the month of April. As soon as snow becomes wet, scattering is reduced as the crystals become coated with liquid water. As a result, the snowpack behaves as a lossy medium, and the brightness temperature increases. In the vicinity of Fairbanks, the 89 GHz brightness temperatures (TBs) averaged 263 K, while in the southern part of the study area (central Alaska Range) TBs were @210 K on 5 April. Deeper snow and lower temperatures contributed to lower TBs there. Additionally, on lines flown north of Fairbanks, toward the Brooks Range and on the North Slope, also on 5 April, TBs are 10-40 K lower than in the Fairbanks area because the snow to the north was still dry in April. Also, in the Brooks Range and on the North Slope, there are no trees to increase the TBs there. Comparison of the vegetation map with the MIR data shows that several land-cover types influence the microwave signal. On each of the 4 MIR images (at 89 GHz) for the Fairbanks grid, a boundary between the black spruce forest and the meadow dryas is evident at a latitude of approximately 64°N, just south of Fairbanks. Coniferous trees emit more microwave radiation than do tundra or dryas vegetation, and this is one explanation for the higher TBs in the black spruce forests. In the central part of the Fairbanks grid, TBs are generally quite high due to the melting snow. The relatively high TBs there overwhelm the brightness-temperature differences that result from land-cover variability. This is especially true on April 13, when the air temperatures were the highest of the 4 flight days (Table 4), and presumably, when melting covered the largest extent of area. Other regions of interest are where finger-like projections of the spruce-birch forest to the east of Fairbanks intersect dryas meadows and barren areas. TBs are higher in the spruce-birch forest (@261 K) than in the dryas meadows and barren areas (@251 K) presumably due to the higher emissivity of the trees. The land-cover type is shown to influence microwave brightness temperature under dry snow conditions. Snow covered forests cause higher TBs than do snow covered dryas meadows and tundra. However, when the snowpack is wet, the high emissivity of the snowpack overwhelms the contribution of the vegetation to the brightness temperature. Work will continue on the current data set to investigate the influence of land cover, particularly the influence of the dryas meadows and black spruce. Satellite data will be analyzed in conjunction with MIR data in order to modify snow depth retrieval algorithms so that they are more responsive to the snow and land surface conditions encountered in central and northern Alaska. In addition, analysis of MIR and MAS data, together, will be undertaken. Assel, R.A., T.E. Croley II and K. Schneider, 1994: Normal daily temperatures and ice cover of the Laurentian Great Lakes of North America, Abstract only, Proceedings of the 51st Eastern Snow Conference, 15-16 June 1994, Dearborn, MI. Barry, R.G., 1986: The sea ice data base, In: The Geophysics of Sea Ice, Untersteiner, N. (ed. ), Plenum Press, NY, pp 1099-1134. Barton, J.S., D.K. Hall and G.A. Riggs, unpublished document, 2001: Thermal and geometric thresholds in the mapping of snow with MODIS, July 11, 2001. Bromwich, D.H., R.-Y. Tzeng and T.R. Parish, 1994: Simulation of the modern arctic climate by the NCAR CCM1, Journal of Climate, 7, pp 1050-1069. Bunting, J.T. and R.P. d'Entremont, 1982: Improved cloud detection utilizing defense meteorological satellite program near infrared measurements, Air Force Geophysics Laboratory, Hanscom AFB, MA, AFGL-TR-82-0027, Environmental Research Papers, No. 765, 91 p.
Carsey, F.D., 1992: Microwave Remote Sensing of Sea Ice, American Geophysical Union, Geophysical Monograph 68, 462 p.
Carroll, T.R., 1990: Operational airborne and satellite snow cover products of the National Operational Hydrologic Remote Sensing Center, Proceedings of the forty-seventh annual Eastern Snow Conference, June 7-8, 1990, Bangor, Maine, CRREL Special Report 90-44. Chang, A.T.C., J.L. Foster and D.K. Hall, 1987: Microwave snow signatures (1.5 mm to 3 cm) over Alaska, Cold Regions Science and Technology, 13, pp 153-160. Chapman, W.L. and J.E. Walsh, 1993: Recent variations of sea ice and air temperature in high latitudes, Bulletin of the American Meteorological Society, 74, pp 33-47. Choudhury, B.J. and A.T.C. Chang, 1981: The albedo of snow for partially cloudy skies, Boundary Layer Meteorology, 20, pp 371-389. Clarke, A.D. and K.J. Noone, 1985: Soot in the Arctic snowpack: a cause for perturbations in radiative transfer. Atmospheric Environment, 19, pp 2045-2053. Comiso, J.C., 1994: Surface temperatures in the polar regions from Nimbus-7 temperature humidity infrared radiometer. Journal of Geophysical Research, 99(C3), pp 5181-5200. Comiso, J.C., P. Wadhams, W.B. Drabill, R.N. Swift, J.P. Crawford and W.B. Tucker III, 1991: Top/bottom multisensor remote sensing of arctic sea ice. Journal of Geophysical Research, 96(C2), pp 2693-2709. Conway, H., A. Gades and C.F. Raymond, 1996: Albedo of dirty snow during conditions of melt, Water Resources Research, 32, pp 1713-1718. De Abreau, R. A., Key, J., Maslanik, J. A., Serreze, M. C., and LeDrew, E. F. (1994). Comparison of in situ and AVHRR-derived broadband albedo over Arctic sea ice. Arctic 147, 288-29. Dirmhirn, I. and F.D. Eaton, 1975: Some characteristics of the albedo of snow. Journal of Applied Meteorology, 14, pp 375-379. Dozier, J., S.R. Schneider and D.F. McGinnis Jr., 1981: Effect of grain size and snowpack water equivalence on visible and near-infrared satellite observations of snow. Water Resources Research, 17, pp 1213-1221. Dozier, J., 1984: Snow reflectance from Landsat-4 thematic mapper. I.E.E.E. Transactions on Geoscience and Remote Sensing, 22, pp 323-328. Dozier, J., 1989: Spectral signature of alpine snow cover from the Landsat Thematic Mapper, Remote Sensing of Environment 28, pp 9-22. Ehrler, C. and K. Seidel, 1995: Mutual effects of the climate change and the alpine snow cover and their influence on the runoff regime evaluated with the aid of satellite remote sensing. Proceedings of the IGARSS '95 Symposium, 1995, Florence, Italy, pp 1973-1975. Foster, J.L., D.K. Hall, A.T.C. Chang and A. Rango, 1984: An overview of passive microwave snow research and results, Reviews of Geophysics, 22, pp 195-208. Foster, J.L., A.T.C. Chang, D.K. Hall and A. Rango, 1991: Derivation of snow water equivalent in boreal forests using microwave radiometry, Arctic, 44 (Supp. 1), pp 147-152. Foster, J. L., and Chang, A. T. C. (1993). Snow Cover. In "Atlas of Satellite Observations Related to Global Change." (R. L. Burney, C. L. Parkinson, and J. L. Foster, Eds. ), pp. 361-370. Cambridge University Press, Cambridge. Grenfell, T.C. and D.K. Perovich, 1984: Spectral albedos of sea ice and incident solar irradiance in the southern Beaufort Sea, Journal of Geophysical Research, 89(C3), pp 3573-3580. Hall, D.K., G.A. Riggs and V.V. Salomonson, 1995: Development of methods for mapping global snow cover using moderate resolution imaging spectroradiometer data, Remote Sensing of Environment, 54, pp 127-140. Hall, D.K., J.L. Foster, D.L. Verbyla, A.G. Klein and C.S. Benson, 1998: Assessment of snow-cover mapping accuracy in a variety of vegetation-cover densities in central Alaska, Remote Sensing of Environment, 66:129-137. Hall, D.K., J.L. Foster, V.V. Salomonson, A.G. Klein and J.Y.L. Chein, 2001: Development of a technique to assess snow-cover mapping errors from space, IEEE Transactions on Geoscience and Remote Sensing, 39(2):432-438. Hall D.K., R.E.J. Kelly, G.A. Riggs, A.T.C. Chang and J.L. Foster, in press: Assessment of the relative accuracy of hemispheric-scale snow-cover maps, Annals of Glaciology, 34. Hall, D.K., V.V. Salomonson, G.A. Riggs, N. DiGirolamo and K.J. Bayr, MODIS snow cover products, Remote Sensing of Environment, submitted. Key, J.R. and M. Haefliger, 1992: Arctic ice surface temperature retrieval from AVHRR thermal channels, Journal of Geophysical Research, 97(D5), pp 5885-5893. Key, J.R., J.A. Maslanik, T. Papakyriakou, M.C. Serreze and A.J. Schweiger, 1994. On the validation of satellite-derived sea ice surface temperature, Arctic, 47, pp 280-287. Key, J.R., J.B. Collins, C. Fowler and R.S. Stone, 1997: High-latitude surface temperature estimates from thermal satellite data, Remote Sensing of Environment, 61, pp 302-309. King, M.D., Y.K. Kaufman, W.P. Menzel and D. Tanre, 1992: Remote sensing of cloud, aerosol, and water vapor properties from the moderate resolution imaging spectrometer (MODIS), IEEE Transactions on Geoscience and Remote Sensing, 30, pp 2-27. Klein, A.G., D.K. Hall and G.A. Riggs, 1998: Improving snow cover mapping in forests through the use of a canopy reflectance model, Hydrological Processes, 12:1723-1744 . Klein, A.G., D.K. Hall and A. Nolin, 2001: Development of a prototype snow albedo algorithm for the NASA MODIS instrument, Proceedings of the 57th Eastern Snow Conference, 17-19 May 2000, Syracuse, NY. Klein, A.G., in press, "Development and validation of a snow albedo algorithm for the MODIS instrument," Annals of Glaciology, 34. Knap, W. H., and Oerlemans, J., 1996: The surface albedo of the Greenland ice sheet: satellite-derived and in situ measurements in the Søndre Strømfjord area during the 1991 melt season. Journal of Glaciology 42,364-374. Kuchler, A.W., 1985: Potential Natural Vegetation, USGS Map from National Atlas, sheet no. 89. Kyle, H.L., R.J. Curran, W.L. Barnes and D. Escoe, 1978: A cloud physics radiometer, Third Conference on Atmospheric Radiation, Davis, CA, pp 107-109. Lindsay, R.W. and D.A. Rothrock, 1993: The calculation of surface temperature and albedo or Arctic sea ice from AVHRR, Annals of Glaciology, 17, pp 391-397. Liston, G.E., 1995: Local advection of momentum, heat, and moisture during the melt of patchy snow covers. Journal of Applied Meteorology, 34(7), pp 1705-1715. Liston, G.E., 1999: Interrelationships among snow distribution, snowmelt, and snow cover depletion: Implications for atmospheric, hydrologic, and ecologic modeling. J. Applied Meteorol., 38 (10), 1474-1487. Liston, G.E., and R. A. Pielke, Sr., 2000: A climate version of the regional atmospheric modeling system. Theoretical and Applied Climatology, 66, 29-47. Magnuson, J.J. and 13 others, 2000: Historical trends in lake and river ice cover in the Northern Hemisphere, Science, 289:1743-1746. Markham, B.L. and J.L. Barker, 1986: Landsat MSS and TM post-calibration dynamic ranges, exoatmospheric reflectances and at-satellite temperatures, EOSAT Technical Notes, No. 1, August, pp 3-8. Massom, R., and J.C. Comiso, 1994. The classification of Arctic sea ice types and the determination of surface temperature using advanced very high resolution radiometer data, Journal Geophysical Research, 99(C3), pp 5201-5218. Matson, M., C.F. Ropelewski and M.S. Varnadore, 1986: An atlas of satellite-derived northern hemisphere snow cover frequency, National Weather Service, Washington, D.C., 75 pp. Matson, M., 1991: NOAA satellite snow cover data, Palaeogeography and Palaeoecology, 90, pp 213-218. Nolin, A.W. and S. Liang, 2000: Progress in Bidirectional reflectance modeling and applications for surface particulate media: snow and soils, Remote Sensing Reviews, 18:307-342. O'Brien, H.W. and R.H. Munis, 1975: Red and near-infrared spectral reflectance of snow. In: Operational Applications of Satellite Snow cover Observations, edited by A. Rango, NASA SP-391 (Washington, D.C.: NASA), pp 345-360. Palecki, M.A. and R.G. Barry, 1986: Freeze-up and break-up of lakes as an index of temperature changes during the transition seasons: a case study in Finland, Journal of Climate and Applied Meteorology, 25, pp 893-902. Parkinson, C.L., J.C. Comiso, H.J. Zwally, D.J. Cavalieri, P. Gloersen and W.J. Campbell, 1987: Arctic Sea Ice, 1973-1976: Satellite Passive-Microwave Observations, NASA SP-489, GPO, Washington, D.C.
Ramsay, B., 1998: The interactive multisensor snow and ice mapping system, Hydrological Processes, 12:1537-1546. Rango, A., 1993: Snow hydrology processes and remote sensing, Hydrological Processes, 7:121-138. Rango, A. and J. Martinec, 1982: Snow accumulation derived from modified depletion curves of snow coverage, Symposium on Hydrological Aspects of Alpine and High Mountain Areas, IAHS Publication No. 138:83-90. Riggs, G.A., D.K. Hall and V.V. Salomonson, 1996: Recent progress in development of the Moderate Resolution Imaging Spectroradiometer snow cover algorithm and product. Riggs, G.A., D.K. Hall and S.A. Ackerman, 1999b: Sea ice extent and classification mapping with the Moderate Resolution Imaging Spectroradiometer Airborne Simulator, Remote Sensing of Environment, 68:152-168. Robinson, D.A., K.F. Dewey and R.R. Heim Jr., 1993: Global snow cover monitoring: an update. Bulletin of the American Meteorological Society, 74:1689-1696. Rosenthal, W., 1993: Mapping montane snow cover at subpixel resolution from the Landsat thematic mapper, Univ. of California Santa Barbara M.A. thesis, 70 p.
Rosenthal, W. and J. Dozier, 1996: Automated mapping of montane snow cover at subpixel resolution from the Landsat Thematic Mapper, Water Resources Research, 32, pp 115-130. Rossow, W.B. and L.C. Garder, 1993: Validation of ISCCP cloud detection, Journal of Climate, 6(12), pp 2370-2393. Salomonson, V.V. and D.C. Marlatt, 1968: Anisotropic solar reflectance over white sand, snow and stratus clouds. Journal of Applied Meteorology, 7, pp 475-483. Salomonson, V.V. and D.L. Toll, 1991: The moderate resolution imaging spectrometer-radar (MODIS-N) facility instrument, Advances in Space Research, 11, pp 231-236. Schindler, D.W., K.G. Beaty, E.J. Fee, D.R. Cruikshank, E.R. DeBruyn, D.L. Findlay, G.A. Linsey, J.A. Shearer, M.P. Stainton and M.A. Turner, 1990: Effects of climatic warming on lakes of the central boreal forest. Science, 250, pp 967-970. Schweiger, A. J., Serreze, M. C., and Key, J. R. (1993). Arctic sea ice albedo: a comparison of two satellite-derived data sets, Geophysical Research Letters, 20, 41-44. Seidel, K., C. Ehrler and J. Martinec, 1997: Effects of climate change on water resources and runoff in an alpine basin, Proceedings of the 1997 Eastern Snow Conference, Banff, Alberta, May 4-8, pp 221-228. Singer, F.S. and R.W. Popham, 1963: Non-meteorological observations from weather satellites, Astronautics and Aerospace Engineering, 1(3), pp 89-92. Steffen, K., 1987, Bidirectional reflectance of snow. In B.E. Goodison, R.G. Barry, and J.Dozier, (editors): Large scale effects of seasonal snow cover. Proceedings of the IAHS Symposium held in Vancouver on 19-22 August 1987 (Vancouver, Canada: IAHS), pp 415-425. Schweiger, A. J., Serreze, M. C., and Key, J. R. (1993). Arctic sea ice albedo: a comparison of two satellite-derived data sets. Geophysical Research Letters 20, 41-44. Stroeve, J., Nolin, A., and Steffen, K. (1997). Comparison of AVHRR-derived and in situ surface albedo over the Greenland Ice Sheet, Remote Sensing of Environment 62, 262-276. Stroeve, J., Nolin, A., and Steffen, K. (1997). Comparison of AVHRR-derived and in situ surface albedo over the Greenland Ice Sheet. Remote Sensing of Environment, 62:262-276. Tait, A.B., D.K. Hall, J.L. Foster and A.T.C. Chang, in press (a): High frequency passive microwave radiometry over a snow covered surface in Alaska, Photogrammetric Engineering and Remote Sensing. Tait, A.B., D.K. Hall, J.L. Foster, A.T.C. Chang and A.G. Klein, in press (b): Detection of snow and vegetation cover using millimeter-wave radiometer data, Remote Sensing of Environment. Townshend, J.R.G. and C.J. Tucker, 1984: Objective assessment of Advanced Very High Resolution Radiometer data for land cover mapping, International Journal of Remote Sensing, 5:497-504. Tucker, C.J., 1979: Red and photographic infrared linear combinations for monitoring vegetation, Remote Sensing of Environment, 8, pp 127-150. Tucker, C.J., 1986: Maximum normalized difference vegetation index images for sub-Saharan Africa for 1983-1985, International Journal of Remote Sensing, 7, pp 1383-1384. Warren, S.G., 1982: Optical properties of snow. Reviews of Geophysics and Space Physics, 20, pp 67-89. Warren, S.G. and A.D. Clarke, 1985: Soot from Arctic haze: Radiation effects on the Arctic snowpack. Snowwatch, World Data Center A for Glaciology (snow and ice) Report GD-18, edited by G. Kukla, R.G. Barry, A. Hecht and D. Wiesnet, Boulder, Colorado. Warren, S.G. and W.J. Wiscombe, 1980: A model for the spectral albedo of snow II: snow containing atmospheric aerosols, Journal of the Atmospheric Sciences, 37, pp 2734-2745. Winther, J.G., 1992: Landsat thematic mapper (TM) derived reflectance from a mountainous watershed during the snow melt season, Nordic Hydrology, 23, pp 273-290. Wiscombe, W.J. and S.G. Warren, 1980: A model for the spectral albedo of snow I : pure snow, Journal of the Atmospheric Sciences, 37, pp 2712-2733. Yu, Y., A. Rothrock and R.W. Lindsay, 1995: Accuracy of sea ice temperature derived from the advanced very high resolution radiometer, Journal of Geophysical Research, 100(C3), pp 4525-4532. Zwally, H.J., J.C. Comiso, C.L. Parkinson, W.J. Campbell, F.D. Carsey and P. Gloersen, 1983: Antarctic Sea Ice, 1973-1976: Satellite Passive-Microwave Observations, NASA, SP-459, 206 p, G.P.O., Wash., D.C.
Level 0 - Raw instrument data at original resolution, time ordered, with duplicate packets removed. Level 1A - Reconstructed unprocessed instrument data at full resolution, time referenced, and annotated with ancillary information, including radiometric and geometric calibration coefficients and georeferencing parameters (i.e. platform ephemeris) computed and appended, but not applied to Level 0 data. Level 1B - Radiometrically-corrected and geolocated Level 1A data that have been processed to sensor units. Level 2 - Derived geophysical parameters at the same resolution and location as the Level 1 data. Level 2G - Level 2 geophysical parameters that have been gridded onto a specified Earth grid. Level 3 - Geophysical parameters that have been spatially and/or temporally re-sampled (i.e., derived from Level 1 or Level 2 data). Level 4 - Model output and/or results of lower-level data that are not directly derived by the instruments.